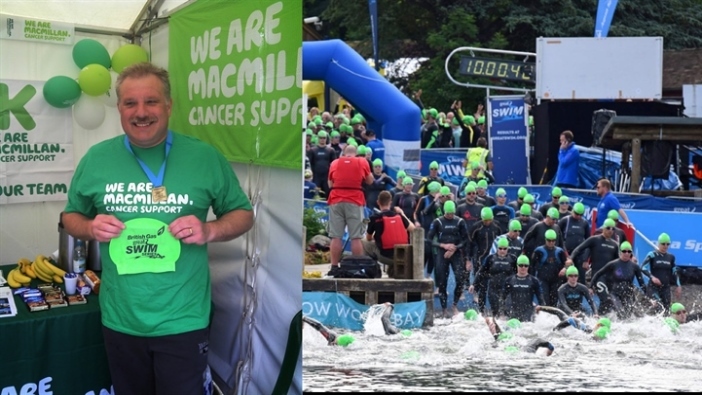 A Dumfries surgeon, who treats patients with bowel cancer, is taking on the Great North Swim to raise money for Macmillan, following his own battle with the disease last year. 61-year-old Fanus Dreyer was diagnosed with lung cancer after a CT scan for another issue showed a suspicious legion. Further tests confirmed the diagnosis and Fanus underwent a lobectomy, the removal of half a lung, at the Golden Jubilee hospital in Glasgow in July 2017, followed by chemotherapy. Fanus said, "I was well prepared for the physical consequences of surgery and how long that recovery would take, but I wasn’t prepared for the emotional and other effects of chemotherapy and its side effects." “Only a few months after surgery I signed up to the Great North Swim as a long term goal, that would keep me mentally focussed in my recovery. I’m now up to walking 10km and back in the gym, albeit taking things slowly. I also returned to work full time last week. “Before my operation I was a keen outdoor swimmer, and had swum 2 miles at both the Great North and Great Scottish Swims. I hope the one mile distance is a realistic goal and it’s given me something to aim for and look forward to. Fanus who had previously raised money for Macmillan recognises the vital role the charity plays in supporting those undergoing treatment. “Macmillan nurses' support at the Day Case Unit at the Beatson West of Scotland Cancer Care Centre was invaluable. They also provide incredible support to our patients at the Macmillan Centre at Dumfries and Galloway Infirmary. Fanus is taking on the 1 mile distance in the Great North Swim which takes place in the awe-inspiring surroundings of Windermere in the Lake DIstrict National Park from 8-10 June 2018. If you'd like to take part you can join Team Macmillan at this years Great North Swim here.